By the end of his presidential administration Coolidge had met these goals, and although some problems persisted in the economy, overall the Harding and Coolidge policies led to a period of tremendous economic growth. It was the economic miracle that was built upon a philosophy of limited, constitutional government. [i] Calvin Coolidge, “Address at Gettysburg Battlefield, May 30, 1928,” Calvin Coolidge Presidential Foundation, <http://coolidgefoundation.org/resources/speeches-as-president-1923-1929-20/> accessed on June 19, 2014. [iii] Richard Vedder and Lowell Gallaway, Out of Work: Unemployment and Government in Twentieth-Century America, New York, Holmes & Meier, 1993, p. 61. [vi] Michael A. Bernstein, The American Economy of the Interwar Era: Growth Transformation from the Great War to the Great Depression, in Calvin Coolidge and the Coolidge Era: Essays on the History of the 1920s, edited by John Earl Haynes, Washington, D.C., Library of Congress, 1998, p. 192. [viii] Out of Work, p. 68. [ix] Jim Powell, “Jump starting the economy,” Cato Institute, September 10, 2010, <http://www.cato.org/publications/commentary/jumpstarting-economy> accessed on June 19, 2014. 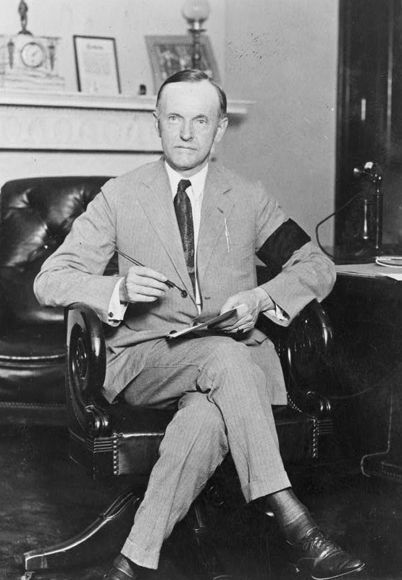 [x] Calvin Coolidge, “Labor Day, Plymouth, Massachusetts, September 1, 1919,” Calvin Coolidge Presidential Foundation, <http://coolidgefoundation.org/resources/speeches-as-governor-of-mass-1919-1920-8/> accessed on June 19, 2014.